by Lawrence R. Huntoon, M.D., Ph.D. Myth #1: Beneficiaries are just getting back what they have paid in. Nothing could be further from the truth. “Current recipients receive over $100,000 more in benefits than they pay in” (Medicare Follies With Orchestration, The Washington Times, June 27, 1997, by Doug Bandow, senior fellow at the Cato Institute). Medicare beneficiaries are under the impression that the money they paid in payroll taxes over the years was put into an actual fund somewhere, where it earned interest and grew over the years, and that fund is now being used to pay for their medical care. That type of fund, however, does not exist. Medicare is financed in a “pay as you go” fashion, whereby wealth is transferred from current workers to retirees to pay for their medical care. Medicare Part A is funded primarily from payroll taxes, so Medicare beneficiaries who are not currently working and paying payroll taxes aren’t contributing anything to Part A (hospitalization) expenses. Part A is strictly a wealth transfer program. Medicare Part B (physician services + home health care) is funded by a combination of beneficiary premium dollars and general tax revenue dollars: 25% from premiums and 75% from general tax revenues. Overall, 87% of total Medicare revenues for Part A + Part B comes from current taxpayers, and only 13% comes from Medicare beneficiaries’ premiums and tax payments. Myth #2: Medicare pays the reasonable cost of medical services. Government price controls have, in some cases, slashed Medicare fees to 10 cents on the dollar compared with the Medicare “allowed charge” 10 years ago. This has forced those who provide these services not only to work without payment, but actually to subsidize the cost. The harder they work, the more money they lose. Myth #3: Without Medicare, most seniors wouldn’t have medical care. The government used carefully doctored statistics to mislead the public into believing that nearly half of the senior population did not have medical insurance coverage prior to the passage of Medicare. These statistics, taken from a 1964 Department of Health, Education and Welfare report, didn’t count an enormous number of people who were covered by a variety of programs including: indemnity policies that paid cash benefits, existing government programs such as the Veterans Administration, and welfare. It also didn’t count those who could afford to pay their own way-i.e. lack of “insurance coverage” is not the same as lack of access to medical care. The fact was that 77% of seniors were eligible for the Kerr-Mills program (Medical Assistance for the Aged), which had been passed into law a full five years before Medicare. The remaining 23%-if they couldn’t afford to pay for their own care-could receive free care at their local hospital. Under the Hill-Burton Act, hospitals agreed to provide free care to anyone who needed it in return for government grants and loans. Thus, all seniors-and everybody else-had access to medical care whether they could afford it or not. 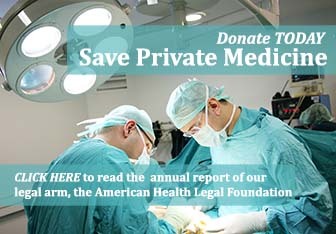 Physicians also were able to provide a substantial amount of charity care to patients who needed it, unlike today, when the physician risks accusations of fraud with accompanying prison time and ruinous fines for failing to charge a Medicare patient what the government deems the patient should pay. Charging a Medicare patient $0.0 can get a physician into a world of trouble today because of government regulations. Myth #4: Seniors were in poorer health before Medicare. Not so, at least not according to the seniors themselves. In a 1960 survey conducted by Emory University (i.e. 5 years before Medicare was passed into law), 10% of seniors reported that they were in poor health. Today, after 36 years of compulsory, one-size-fits-all medical care under Medicare, 26.7% of seniors report that they are in poor health. Myth #5: Medicare is low-cost insurance. The Medicare program covers approximately 40 million people at a cost of about $220 billion dollars-or about $5,200 per person. By contrast, the medical insurance program for Congress and other federal employees, the Federal Employee Health Benefits Program (FEHBP), covers approximately 9 million people at a cost of about $2,200 per person. The FEHBP offers people more freedom of choice at less than half the cost of the Medicare program. Myth #6: Medicare has low administrative costs. The Center for Medicare and Medicaid Services (CMS, formerly called HCFA or the Health Care Financing Administration) claims to spend less than 2% of Medicare benefit outlays on program management. This totally disregards the enormous administrative expenses they have foisted onto hospitals and doctors, the real costs of complying with the 132,000 pages of ever-changing Medicare rules and regulations. A typical hospital spends about 38,400 man-hours per year just sorting through Medicare billing requirements alone. Moreover, the “administrative simplification” provisions of the Health Insurance Portability and Accountability Act of 1996 (HIPAA or the Kassebaum-Kennedy Law), which the Department of Health and Human Services (HHS) estimated would cost about $3.8 billion over 5 years, actually cost $43 billion (Kathleen Murray, American Hospital Association, quoted in AAPS News Suppl July 2000). Hospital staff currently spend about 30 minutes on paperwork for every hour spent caring for a Medicare patient. Two-thirds to three-fourths of this work isn’t related to actual patient care at all. The administrative costs to physicians are not as well quantitated, but we note that the cost of entering data into an electronic format whereby it can be cheaply processed by the Medicare carrier has been shifted to physician offices over the past decade. The cost of compliance has increased rapidly over the past decade. An AAPS survey found that 22% of doctors’ and staff time is spent on compliance with Medicare regulations and that Medicare claims cost on average 26% more to process and handle than private claims. There are now 11 decisions that a physician has to make just to select the proper Evaluation and Management (E&M) code, according to Medicare program guidelines. Each decision point requires several choices. There are a total of 42 choices a physician must consider in choosing the proper E&M code. There are a whopping 6,144 possible combinations of items involved in properly classifying a new patient office visit! CMS also fails to consider the “administrative cost” of collecting the taxes necessary to pay for this government medical program. It is clear that complying with excessive regulations consumes precious time, money, and resources which could be better spent on direct patient care. Myth #7: The Medicare Trust Funds are safe; they even have a surplus. The estimated cost of the Medicare program in 2011 will be $491 billion or 19% of total federal spending. Costs will more than double in that year when the Baby Boom generation begins to retire. According to the U.S. Census Bureau, the 65-and-over segment of the population will increase by nearly 80% by 2025. But, there will be only 15% more working-age adults. Instead of three workers supporting one retiree as is the case now, there will be only two. This means higher taxes. How much higher? In order to meet the expenses of Part A Medicare in 2016, payroll taxes will have to increase from the current 2.9% to 4.88%! Federal income taxes will also have to increase to cover Part B expenses. The Congressional Budget Office estimates that Medicare + Medicaid + Social Security will consume 75% of the Federal Budget by the year 2030. At the present time, Medicare trustees estimate that the Hospitalization Trust Fund (Medicare Part A) will be insolvent by 2029. The Medicare Part B “Trust Fund” will never be insolvent, because it is principally financed by general tax revenues, and the government can always raise taxes to cover rising expenditures. Part B expenditures are currently rising faster than Part A expenditures. The “surplus” in the Medicare Part A Trust Fund never existed! It was nothing more than an Enron-style accounting gimmick. As part of the Balanced Budget Act of 1997, Congress shifted one of the fastest growing Medicare expenses, home health care costs, from the Part A Trust Fund to the Part B Trust Fund. Total expenditures remained unchanged. In reality, the “Trust Fund” itself does not exist. There is nothing in it except IOUs that must be redeemed by future taxpayers as soon as Medicare is unable to take enough from the wages of current workers to pay the medical bills of retired workers. How much taxation will the working population tolerate before a revolt occurs? How low can Medicare fees be slashed before physicians revolt and patient access is severely compromised? Nobody knows, but at some point either a revolt on the revenue side or on the expenditure side of the equation will provide the spark that explodes the demographic time bomb and ends in the total collapse of the Medicare Ponzi scheme. It is not a question of if; it is a question of when. Myth #8. Medicare can afford to add a new drug benefit. A new drug benefit in the Medicare program would add at least $338 billion dollars in additional cost over a 10-year period. It should be noted that less than one-third of current beneficiaries lack drug coverage. A full 70% already have drug coverage through other insurance, such as Medicare supplements. Adding an additional drug benefit would cause the Medicare program to become insolvent sooner – like adding additional weight to a sinking ship. Myth #9. The problem could be solved by forcing the rich to pay their fair share. What is a “fair share”? Economist Walter Williams writes: “According to the most recent U.S. Treasury Department figures in 1997, the top 1% of income earners (those with incomes of $250,000 and higher) paid 33% of all federal income taxes. The top 5% of income earners ($108,000 and over) paid 52%, and the top 50% ($36,000 and over) paid 96% of income taxes. That means the bottom 50% of income-earners paid only 4% of all federal income taxes…. “From a moral point of view, we might ask just how fair is it to allow those who pay little or no taxes to use the political process to decide how much taxes others should pay?” (Ideas on Liberty, Jan 2002, pp. 63 – 64). Also, although minimum wage workers may not earn enough to pay income taxes, they still have money confiscated from their meager earnings via payroll taxes to pay for the medical care of seniors who are, in general, more affluent. Is this process of transferring wealth from the poor to the rich called “social justice”? Moral issues aside, it is a simple fact that increasing tax rates reaches a point of diminishing returns. We know what happens when the golden goose gets throttled a little too vigorously. Myth #10. Medicare bureaucrats are there to help you. The Medicare bureaucracy consists of 4,500 employees, who supervise 55 Medicare carriers nationwide. In 2001, because of its poor reputation with physicians and others who deal with the bureaucracy, HCFA changed its name to CMS. As a result of an increased workload imposed via Congress in various Balanced Budget Acts, HCFA/CMS is having increasing difficulties, and morale is said to be quite low. HCFA/CMS has a fairly high turnover in its top positions. Over the past 23 years, HCFA/CMS has had a total of 17 different administrators. Still, the darling of single payor advocates has been gradually expanding its control over the medical care of seniors, children, and parents. The Medicare bureaucracy determines whether your care is “medically necessary.” That means, high school graduates do. The bureaucrats’ response to these revelations: “HCFA, though, says it’s satisfied with the educational level of the carrier personnel who review claims” (ibid.). This GAO report was requested because a “whistleblower,” Theresa Burr, accused a Medicare contractor in Florida (Florida Blue Cross and Blue Shield) of “fraud and unwarranted large-scale denials of covered benefits” (ibid). Myth #11. Medicare’s fiscal troubles are largely caused by physicians who defraud the system. Medicare makes frequent accusations. Unfortunately, because of the Federal Tort Claims Act (FTCA), HCFA/CMS bureaucrats and Medicare contractor personnel can commit crimes against physicians with no fear of ever being held accountable in a court of law. These intentional torts include libel, slander, misrepresentation, deceit, and interference with contractual rights. “Allowed Acts” also include wrongful denial of Medicare claims and benefits, making totally negligent misrepresentations in alleging fraud, and rendering incomplete, inaccurate and/or erroneous opinions to physicians-Pani v. Empire Blue Cross Blue Shield, 152F 3d 67 (2nd Cir. 1998). Medicare bureaucrats also enjoy nearly iron-clad protection from being held accountable for their actions under “Official Immunity” and the “Medicare Preclusion Law.” Under “Official Immunity,” Medicare bureaucrats cannot be held accountable as long as they were acting within the broad scope of their authority under the Medicare program-in which Medicare bureaucrats write all of the rules and regulations. 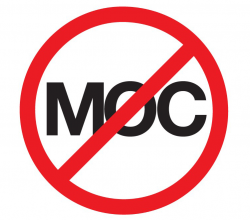 Under the “Medicare Preclusion Law,” 42 U.S.C. Sec 405 (h), no lawsuit can be brought against a Medicare contractor or employee or HCFA/CMS bureaucrat or the agency if the suit arises out of the Medicare Act. Of course, everything such people do essentially “arises out of the Medicare Act,” and they cannot, therefore, be sued, by definition. The legal rationale for the Medicare Preclusion Law is that complaints about Medicare personnel are merely “disguised payment disputes.” All payment disputes are subject exclusively to the Medicare appeals process and not subject to judicial review unless all other administrative challenges have been exhausted. Myth #12. Patient care is not jeopardized by Medicare fraud initiatives, fee cuts, or hassles. A survey conducted by the Association of American Physicians and Surgeons (AAPS) in July 2001 reported that 78% of responding physicians had an increased fear of prosecution and had made changes in their practice as a result. Changes include restricting more complex services or services that HCFA/CMS might question. 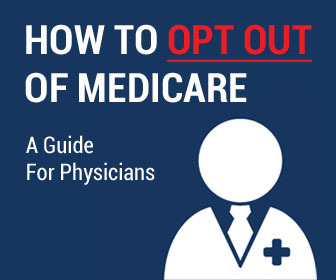 Nearly 25% reported that they accepted no new Medicare patients in their practices, and nearly 40% said they had difficulty finding physicians who would accept a referral of a Medicare patient. Myth #13. Medicare patients have access to the best in medical technology. It took the Medicare bureaucracy more than 8 years to approve bone density scans, which are used in the diagnosis of osteoporosis. It took the bureaucrats more than 10 years to approve PET scans. “There is growing evidence that Medicare delays and denies life-saving medical technology to Medicare patients that is readily available to millions of Americans covered by private insurance” (Robert Moffit, Ph.D., AAPS News Suppl, Jan 2001). Sometimes the bureaucracy decides that the new technology will be a “covered service” but fixes the price so low that it knows patients won’t be able to get it. A case in point is the bladder cancer test developed by Bion Diagnostics. The Medicare bureaucrats decided to make this a “covered service,” but they cut the allowed fee by 70%. Most physicians could not afford to offer this test at a financial loss. In my own experience with diagnostic neuro-ultrasound, the Medicare bureaucrats slashed the allowed charge for one of the ultrasound tests by 90% over a 10-year period. It’s a “covered service,” but at a payment rate of 10 cents on the dollar, it’s not economically feasible to provide it to patients. And, remember, that patients are not allowed to pay a higher price for these technologies or any other “covered service,” as that is strictly against the law. Dateline 1962: “The Great Madison Square Garden Debate” – The AMA vs. Medicare. The Association of American Physicians and Surgeons (AAPS) also weighed in on the great Medicare debate. 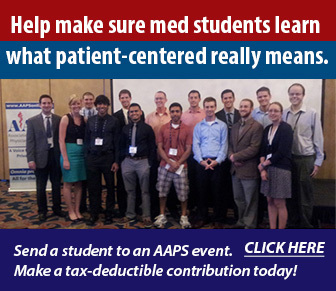 Founded in 1943, the AAPS is the only national medical organization that has consistently supported free-market principles in medicine and has consistently opposed all attempts to degrade the patient/physician relationship via government-controlled, socialized medicine. The AAPS has never minced words-it has repeatedly pointed out to the American public that Medicare is socialized medicine for the elderly and that socialism is a concept abhorrent to a nation based on individual freedom. AAPS advocated “non-participation” in socialized medicine to its members at that time and maintains a non-participation program today. [Now with 132,000 pages of Medicare regulations, the federal government interferes with every aspect of the practice of medicine. Federal bureaucrats oversee all hospital care, “setting standards” (as through JCAHO) and demanding reports. Via “medical necessity” pronouncements, they determine who gets in and who gets out of the hospital. And, via DRGs, they determine how long a Medicare patient will stay. They determine the manner in which medical services are provided and how they must be documented. And, the government has instituted a system of price controls and price fixing for most medical services provided today (RBRVS, Balance Billing Laws, Correct Coding Initiatives etc)]. The Medicare system was doomed from its beginnings. Drastic change is needed to save medicine for today’s seniors, and their offspring. The first step is to find out the truth and not be misled by the Medicare Myths.